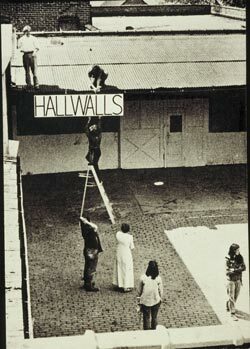 Hallwalls was founded on Buffalo's West Side in late 1974 by a group of young visual artists (some of them still just students at the time)—including Diane Bertolo, Charles Clough, Nancy Dwyer, Robert Longo, Larry (LP) Lundy, Cindy Sherman, and Michael Zwack—who carved an exhibition space out of the walls of the hall outside their studios in a former icehouse. From the beginning, their interest was in exhibiting new work by local artists (including, at first, their own) and providing opportunities for exchange between them and artists in other cities, by inviting visiting artists to give talks or create installations, and by organizing exchange shows with similar spaces springing up in other cities. 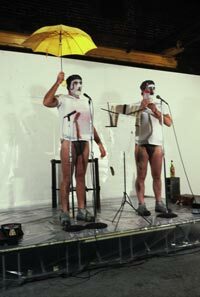 Their focus was always interdisciplinary as well as outward looking, featuring not only visual artists, but also musicians, writers, filmmakers, and video and performance artists. Hallwalls soon established itself as an influential force for innovation within the community as well as nationally, and stretched its then minimal resources by joining forces with other cultural institutions—both larger and smaller—on collaborative projects. All of these founding principles and artistic strategies continue to guide the organization today. But in the ensuing three decades, Hallwalls necessarily enlarged not only its reputation in the field, but its outreach within the community, embracing wider and more diverse publics. 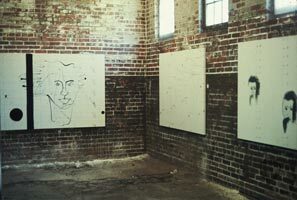 Hallwalls' programs grew in distinctly different directions, depending on their curators' interests and the needs of the disciplines and communities they served, always unified, however, by Hallwalls' mission to bring the newest and most challenging work in the contemporary arts to the interested public, whether in painting and sculpture, conceptual art, experimental film, video art and activism, documentary film, performance, fiction, jazz, new music, or any number of other art forms that make up Hallwalls' eclectic programming mix. After a spurt of growth in the late 1980s, public arts funding at all levels of government was cut drastically, accompanied by attacks on artists' free speech. Hallwalls—like all organizations nationwide—was forced to cut back, both its overall budget and its staff size, while simultaneously embracing a new additional role as a fearless advocate for artistic freedom as well as innovation. The downward trend in public funding plateaued somewhat toward century's end, but has plummeted even more steeply since 2000. 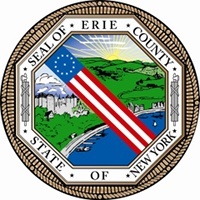 But by making more cuts, joining forces with other organizations to share resources (as well as advocating for restored funding), and increasing both earned revenue and fundraising efforts, Hallwalls has managed to survive and carry on its mission. The quality and quantity of our programming is undiminished, and we actually have more members by far and many more people coming through our doors than in the late '80s and very early '90s when our annual budget was larger. People are constantly astonished at the volume, range, and influence of our programming in so many different disciplines, especially with such a small core staff and on such a relatively modest budget.